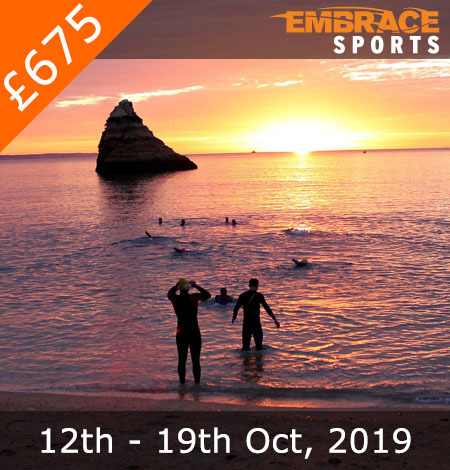 Reserve your place on this October triathlon holiday. When It’s cooling down in other parts of the world the sun is still shining in the Algarve, Portugal. 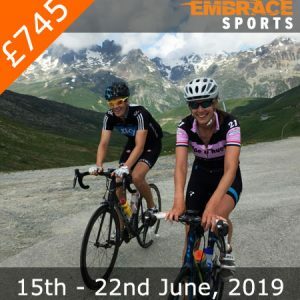 This triathlon training camp is your chance to dedicate a week to training while also having fun and exploring this great location. I am new to triathlons so I was a little apprehensive about the trip. I shouldn’t have worried. The guys were very accommodating, helpful and encouraging. I may have broken the record of the longest time spent in transition and I was nearly sick after the Hell on the hills but I had an amazing time, picked up heaps of tips, met some lovely people and had loads of fun. Thank you All! This was my second Embrace ‘holiday’ and my second October Triathlon. I was a little reticent to repeat the same holiday from last year, but I needn’t have worried. The sessions were varied and adapted to the people present, and the only ‘issue’ about returning was knowing what Hell on the Hills had in store for me! The coaches were great as usual, and all other aspects from the location, to the accommodation and the sessions were fantastic! I’d be tempted to return next year, but maybe I’ll try something different instead….. I hold my hands up – I’m a bit biased here. This is the 7th time I’ve been on an Embrace training holiday. There is a reason for that – these guys are the BEST at what they do! The week was structured with a variety of challenging yet always fun sessions, ensuring that all abilities and levels are catered for. 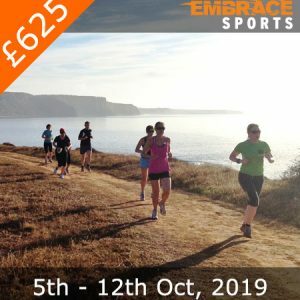 There was early morning ocean swims, long, scenic rides on the bike, beautiful woodland trail running, duathlon, fun aquathlon, pool swimming, brick runs, plenty of coaching and advice….and the most amazing food and lovely company. What more can you want!? I really enjoyed the camp once again. Great group, really good sessions, and amazing food. See you in March! I had a great time, the coaches and group were fantastic, we all got on really well and supported each other. The accommodation and food were also amazing, and I loved the fact that the town and beach were within walking distance. Being mostly at the back of the group when cycling, I always had either Neil or Graeme in sight so I wouldn’t get lost :-). Thanks guys! I’ve been trying to succinctly say how I felt about my holiday, but like in the title, it was just way beyond all my expectations. The food, the location/accommodation, the coaches, the sessions, my fellow ‘holiday-makers’, the weather, the sea-swimming, I learned so much and had such an amazing time. I really didn’t want it to end… It felt more like a ‘family adventure’, than a ‘training camp’. I am definitely coming back, if you will have me!! I have just returned from this holiday and had a fantastic week. The swimming and cycling was great and the food and hospilatily of Graham, Kat and Neil was fantastic. I recommend this holiday for all levels, the coaching and tips I have picked up have been invaluable. I also hurt my foot and couldn’t run but I was given many alternative training sessions so didn’t feel like I was missing out. Thank you Embrace! I’ve just spent a fantastic week with Neil, Greame, Neil, Kat and the crew at Embrace. As a relatively inexperienced triathlete, I didn’t really know what to expect from the week’s training but I had nothing to worry about. The guys trained us hard but made it really enjoyable. And the hospitality was great – lovely apartments, fantastic food and great company. From the moment we arrived, the whole group just got on so well, it felt like being away with a bunch of friends, not people I had only just met. I would certainly recommend an Embrace holiday for anyone who enjoys training. Great work Graeme, Neil and Rachel. Good support and patience. I did the October Triathlon holiday in 2014 and it was such an incredible week. I turned up a complete amateur who had dabbled in the sport in a very casual way, and they catered for my inexperience 100% and pushed me to see what I could achieve. It gave me amazing confidence in my abilities and I booked another two weeks the day I got home! There is no distinction between the best, fittest and most experienced and those with less experience. Embrace and the coaches (Graeme, Kat, Alan, and Andy) made sure that everybody got the most out of the week. And we baked, which is ALWAYS a bonus! I then got home and won a triathlon the very next day!